Nov. 28–29 (10 a.m.–4 p.m.) Reserve your seated estate tasting featuring five single-vineyard Pinot Noirs from the highly acclaimed 2012 vintage, complimented with an artisan cheese plate. Reservations required Friday and Saturday, group size limited to eight people or fewer. Tasting room open on Sunday. Fee: $30 (complimentary for A-List members and a guest). Nov. 22–23; Nov. 28–29 (noon–5 p.m.) Our family will be pouring our estate Summit Vineyard Pinot Noir, our estate Wine Country Farm Pinot Noir and introducing our Russell Grooters Pinot Noir. Other varietals to be featured are: Pinot Gris, Chardonnay, Müller Thurgau, Rieslin, and our award-winning Late Harvest Riesling for dessert. Fee: $10 (includes wine glass). Nov. 28–30 (11 a.m.–5 p.m.) Join us over Thanksgiving Weekend for our annual open house. We will be releasing our brand new 2013 Melon de Bourgogne and our 2012 Dundee Hills Pinot Noir. Grass fed LRR burgers will be sold all weekend long. Fee: $20 (includes wine glass). Nov. 28–29 (11 a.m.–3 p.m.); Nov. 30 (11 a.m.–4 p.m.) Welcome the holiday season in an intimate, festive setting. Reserve your seated tasting, featuring a six-wine flight paired with a sensory tasting plate, and a preview of a 2013 Pinot Noir barrel sample. Reservations required Friday and Saturday; party limit of eight. Fee: $40 (complimentary for club members). Nov. 28–29 (10 a.m.–5 p.m.) Join Durant Vineyards for Thanksgiving Weekend. A wine flight of four estate wines, including library selections, small bites paired with our Olio Nuovo (New Olive Oil) will be featured Friday and Saturday. Fee: $15. Nov. 28–30 (noon–6 p.m.) Join us for a Thanksgiving Weekend celebration. Nov. 28–30 (11 a.m.–5 p.m.) Come taste and enjoy our newest Methven Family wine releases along with delicious foods to pair with your wines like specialty cheeses, salumi and salami, fresh baked bread and fruit. Our friends at Honest Chocolates have created a one-of-a-kind chocolate infused with our very limited Beekeeper Riesling that we will pair all weekend long with our wine to tickle your taste buds. Music by Big Ron Sabin will entertain you from noon–4 p.m. Fee: $15. Nov. 21–23 (10 a.m.–4 p.m.) Olio Nuovo Festa: a celebration of New Olive Oil. Nov. 21–23, celebrate the completion of the year’s olive milling season. This is the first chance to taste and purchase our brand new olive oil. Olio Nuovo will be paired with some delicious appetizers and wine. Tours of the olive mill will be offered all day. This is a complimentary event and no reservations are required. Fee: none. Nov. 28–30 (11 a.m.–5 p.m.) Taste the Willamette Valley in one stop: enjoy single-vineyard Pinot Noir or mixed varietal flight. Each wine a distinctive representation of its AVA. Local artisan culinary food products and winemaker recipes connect our wines to your home kitchen. Fee: $10. Nov. 28–29 (10 a.m.–4 p.m.) Come with friends and family for our Thanksgiving open house in our beautiful tasting room. Enjoy a tasting of our highly anticipated and newly released 2012 Dundee Hills Pinot Noir as you sample our new gourmet Sokol Blosser food products. Fee: $20. Nov. 28 (10 a.m.–4 p.m.); Nov. 29–30 (11 a.m.–4 p.m.) Join us Thanksgiving Weekend for our Winter Country Market featuring local purveyors, including Fino & Fondo, Willamette Valley Cheese Co. and Long Brewing, and enjoy newly released Stoller wines. Fee: $20 (includes wine glass). Nov. 28–30 (11 a.m.–5 p.m.) Enjoy breathtaking views from the top of the Dundee Hills, relax in our tasting room with family and friends, and learn about our Neo-Classical approach to making Pinot Noir. We will pour a selection of newly released 2012 Pinot Noirs. Fee: $25. Nov. 28–29 (11 a.m.–5 p.m.) Exceptional wines, breathtaking views, genuine hospitality. Tastings are conducted within the winery, so you can see, smell, and understand how we make our wines. Enjoy Pinot Noir, Pinot Gris, Pinot Blanc, rosé and dessert wines all sourced from our estate vineyard. Tasting fee includes souvenir Pinot Noir glass. Closed Sunday. Fee: $15 (includes wine glass). Nov. 28–30 (10 a.m.–5 p.m.) Join us at the tasting room for incredible wine, food, music and fun all weekend long. Special releases and pricing for the wee kend. Four tasting rooms, a farm-fresh cafe and boutique hotel in one location. Loads of parking and special rates for the day. Fee: $10. Nov. 22–23; Nov. 28–30 (10:30 a.m., 1 and 3:30 p.m.) Winemaker Maggie Harrison and assistant winemaker Andrew Riechers will be hosting three intimate tastings a day at the winery in Dundee. The tastings will feature each of our five wines from 2013 and the current release from Maggie’s Syrah project, Lillian. There are only 12 seats available at each seating; reservations are highly recommended. Fee: $30. Nov. 28–29 (11 a.m.–5 p.m.) Come see Argyle Winery as you’ve never seen it before. Enjoy tastings of 2011 Vintage Brut, 2011 Argyle Riesling, 2012 Nuthouse Chardonnay, and 2012 Spirit Hill Vineyard Pinot Noir (our first vineyard designate wine off of our Spirit Hill Vineyard) and nibbles. Sign up for special tastings throughout the day, and visit our Big Bottle Bar. Come join the holiday fun. Fee: $20 (includes wine glass). Nov. 28–30 (11 a.m.–6 p.m.) Celebrate the holidays by visiting our small family-owned winery and taste “Two Worlds of Pinot Noir.” We will be serving a selection of our Dundee Hills Pinot Noir and our Central Otago New Zealand Pinot Noir and Marlborough Sauvignon Blanc. A special treat will be tasting our stunning 2008 Dundee Hills Pinot and 2008 New Zealand Pinot. Owners always serve their wines with a cheerful smile. Look for our handmade barrel fence and “Giant Corkscrew.” Fee: $10 (includes wine glass). Nov. 28–30 (11 a.m.–5 p.m.) Final weekend of our 11th season. Featuring our 2013 Gris-Ling®, 2011 Winemaker Series (three Pinot Noirs, three tremendous winemakers, one spectacular vineyard) and our 2011 Two Row Proprietor’s Cuvee. Come toast “The Beautiful Life” while overlooking our picturesque vineyard views. Fee: $20 (includes wine glass). Nov. 29–30 (11 a.m.–5 p.m.) Give thanks. Live large. Drink Chapter 24. Visit our new tasting room in Dundee for Wine Country Thanksgiving Weekend, with your host Jessie Gordon and our winemaker Max Marriott. Drink delicious and eat tasty, with food trucks on site. Think Pinot, Drink CH24 Fee: $20. Nov. 28–30 (11 a.m.–5 p.m.) Crumbled Rock Winery is a small family winery in the Dundee Hills. Come celebrate with us this Thanksgiving Weekend. Fine wine, great views, special treats. We look forward to seeing you. Fee: $8. Nov. 23 (11 a.m.–5 p.m.) Nov. 28–30 (11 a.m.–6 p.m.) We’re thankful for our warm tasting room and award-winning wines. Come raise a glass with us this weekend. Nov. 23: Winter Release Party featuring Winemaking Series No. 2 : Join us for a fun, educational, interactive afternoon. New release wines with food pairings by Rogue Gourmet Catering Co. Fee: $10; Nov. 23: $15 (complimentary for club members and 3 guests). Nov. 21–23; Nov. 28–30 (11 a.m.–5 p.m.) Thanksgiving Weekend: Enjoy our amazing Rhone-style variatels, from Viognier, Syrah and Tempranilla Reserva, to our 2009 Cancilla Pinot Noir. Pairing with lite bites and a complimentary Go-Vino signature wine glass. Pre-Thanksgiving: wine tasting with complimentary lite bites, a signature Go Vino wine glass and a signature burlap wine bag Fee: $20 (includes wine glass). Nov. 22 (1–4 p.m.); Nov. 28–29 (11 a.m.–5 p.m.) We’ll offer two tasting options. Classic Flight ($10; $5 club): tasting of Pinot Gris, Chardonnay, Pinot Noir, Gamay Noir and dessert wine. Pinot Noir Flight ($35; $25): includes an Oregon Riedel glass to keep, plus tasting of 2013 Pinot Noir, Conservation Cuvée Pinot Noir (Lot 2), 2012 St. Jory Vineyard Pinot Noir, 2012 Coles Valley Vineyard Pinot Noir and 2012 Willow Creek Vineyard Pinot Noir. Nov. 22: Come celebrate the official release of Conservation Cuvée Pinot Noir. We’ll have dozens of wildlife art submissions for this year’s ODFW Conservation Stamp Program on display; winning artwork announced at the event. Fee: $5–$35. Nov. 28 (11 a.m.–4 p.m.) Our new tasting room is under construction; come see our progress. Don a hard hat, taste our esteemed Pinot Noirs and the first vintage of our estate Chardonnay. We will only be open on Friday of the holiday weekend. Fee: $20 (includes wine glass). Nov. 28–30 (11 a.m.–4 p.m.) Discover the Art of Pinot at Erath. Sample exclusive single-vineyard Pinot Noir selections only available at the winery. Enjoy our picturesque views of the Dundee Hills while savoring classic Oregon Pinot. Cellar Society members receive complimentary admission for two. Event fee includes wine flight and logo glass. Fee: $15 (includes wine glass). Nov. 22–23; Nov. 28–30 (10 a.m.–5 p.m.) Celebrate Thanksgiving with ELV. We will be tasting our newly released 2013 Celebration Gamay Noir from Seven Springs Vineyard, a perfect wine for your holiday meals this year. Special treats will also be available. Fee: $20 (complimentary for club members). Nov. 28–30 (11 a.m.–5 p.m.) Got Pinot fatigue? Savor a Double-Gold medal-winning Rhone blend and release of the 2013 Caldera Red, plus we’re pouring Syrah, Viognier and Sangiovese. Oh, and the 2013 Eola-Amity Pinot Noir, too. Hearty breads, soups, meats and cheeses. All wines under $40. Fee: $15. Nov. 28–30 (11 a.m.–5 p.m.) Experience Oregon history this weekend with a special food and wine tasting of the newest releases from the historic Hyland Vineyard. On Saturday, we’ll do a special Harvest tour at 10 a.m. RSVP today. Hyland logo glass included. Fee: $15. Nov. 28–30 (11 a.m.–5 p.m.) Join the Lange family in celebration of the season and the completion of our 28th harvest in the Dundee Hills. Take in the stunning views while enjoying our newest releases of world-class Pinot Noir, Chardonnay and Pinot Gris paired with seasonally sumptuous hors d’oeuvres. Fee: $20. Nov. 22–23; Nov. 28–30 (10 a.m.–5 p.m.) Join us for the 2012 vintage release. Highly acclaimed – find out why. Experience our consistently honored, limited production, rock-grown Pinot Noir at our Dundee Tasting Room location. Featuring Le Cadeau cuvées, reserves, and Aubichon Cellars vineyard-designate Pinots. Fee: $10 (refundable with purchase). Nov. 22 (10 a.m.–5 p.m.); Nov. 28–30 (10 a.m.–4 p.m.) Celebrate the holidays with Panther at our new location in Dundee. We will be enjoying our lush 2012 Pinot Noirs as well as some delicious library wines. Nov. 22: Join Panther Creek in our new tasting room in Dundee with pre-releases, a barrel sample and of course Shea Vineyard Pinot Noir paired with light bites. First 25 guests each day will receive Panther Cash. Fee: $20. Nov. 28–30 (11 a.m.–5 p.m.) Thanksgiving Weeknd, taste dynamic cool-climate wines from husband-and-wife winemakers Eric Hamacher and Luisa Ponzi. Each with more than 20 years of experience, taste their unique styles. Small plates by The Dundee Bistro to pair with your flight. Case discounts on Ponzi wines. Fee: $15. Nov. 28–30 (11 a.m.–5 p.m.) Join us for a Thanksgiving Weekend celebration at our quaint tasting room in the Dundee Hills. We will be pouring five wines and a sneak preview of our 2013 releases. We will have yummy nibbles to complement our delicious wines. Nov. 21–23; Nov. 28–30 (10 a.m.–5 p.m.) Join us for our new releases from our reserve estate wines, we will be pouring our 2012s of GSM, Reserve Syrah, Ryan’s Reserve and Reserve Excelsior, with local NorthWest cheese and charcuterie. Also, for a limited time, we will be selling our vertical of Excelsior 2008, 2010 and 2011 for $100. Come on over and taste Walla Walla Wines in the heart of Dundee. Fee: $10 (refundable with two-bottle purchase). First 10 people in the tasting room on Friday get 10 percent off their purchase). Nov. 28–30 (11 a.m.–5 p.m.) Nestled in the Red Hills of Dundee, The Four Graces is a perfect place to spend your Thanksgiving Weekend. Enjoy a flight of five exquisite wines out of your new logo glass and buy your favorite bottle to take home with you. #deckthehills Fee: $20. Nov. 28–29 (11 a.m.–4 pm. ); Nov. 30 (noon–4 p.m.) An amazing view, fun people, a friendly dog and great wines poured for you by the owner/winemaker. We’re introducing our very limited 2012 Reserve Pinot Noirs — The Macdougall and Block 21 — and pouring favorites, including our Pinot Gris, Pinot Blanc, Chardonnay and Three Pinots Pink. Tasty treats and special discounts all weekend. Fee: $10 (refundable with purchase). Nov. 28–30 (11 a.m.–5 p.m.) Come mingle with our winemakers and celebrate the holiday season with us. We’ll be pouring stellar whites, reserve and single-vineyard Pinot Noirs, decadent Port and our brand new barrel-aged Pinot Noir Brandy. Daily specials and case discounts. #deckthehills Fee: $15. Nov. 29–30 (11 a.m.–4 p.m.) Pouring a selection of Pinot Noirs from the highly regarded 2012 vintage along with the release of our 2013 Chardonnay. Small bites to accompany and a Pinot Noir glass to remember your day along with a donation to ¡Salud! from your tasting fee. Fee: $20. Nov. 22–23; Nov. 28–30 (11 a.m.–5 p.m.) Enjoy some of our older and obscure releases. Fee: $5 (refunded with purchase). Nov. 28–30 (11 a.m.–4 p.m.) Taste reserve and single-vineyard wines, including 2012 Calkins Lane Pinot Noir from the estate vineyard surrounding the winery. Discover Adelsheim’s history and vision, where a legacy of innovation and craftsmanship lead to alluring wines of exceptional finesse. Fee: $20 (complimentary for club members). Nov. 28–30 (11 a.m.–5 p.m.) There is no better time of year to taste our highly rated estate-grown wines than Thanksgiving weekend. Be among the first to taste our recently released 2012 Pinot Noirs in our Gold-LEED certified tasting room and three-level gravity flow winery. Fee: $20 (complimentary for club members). Nov. 28–30 (11 a.m.–5 p.m.) Special reserve Pinot Noir flights, an early glimpse of our 2012 Pinots, customized three-bottle gift boxes, extremely limited magnums, and our fabulous annual Cork Cage and grapevine wreath sale. Local cheeses and other delicacies in abundance. Donate to the Food Bank for 2-for-1 tastings. Much to be thankful for. Fee: $10–$20. Nov. 28–29 (11 a.m.–5 p.m.) For the 2014 Thanksgiving holiday, we’re only open by appointment for wine club members — Anderson Family Friends — to pick up fall allotments. Nov. 28–30 (10 a.m.–4 p.m.) Stop by and taste new and current releases of our Aramenta Ribbon Ridge Pinot Noir. Also pouring 2012 Brothers Pinot and Chardonnay. Food pairings included with tasting fee. Fee: $10. Nov. 28–30 (11 a.m.–5 p.m.) Join us for our annual Thanksgiving Weekend Open House. Sip our current release Pinot Gris, Sauv Blanc, Pinot Noirs and Semillon dessert wine. Relax in our casual tasting room while tasting some great wines. Fee: $20 (includes wine glass; light hors d’oeuvres; refunded with minimum purchase of $150 or enrollment in one of our wine clubs). Nov. 28–30 (11 a.m.–5 p.m.) Come taste six wines, including our new releases of Gewürztraminer and estate Pinot Noir, paired with delicious appetizers. Bring your friends and family and relax in our tasting room and salon. Tamu sana. Fee: $8 (waived with two-bottle purchase). Nov. 28–30 (11 a.m.–5 p.m.) Join us at August Cellars as one of the tenant wineries pouring for the long weekend. We’ll have a selection of our wines available for tasting. Food and Pitch Dark Chocolate will be available. Nov. 28–30 (11 a.m.–5 p.m.) Yelp review: “Memorial Day Weekend 2014: Marvelous time with no less than six of the finest wine makers… Unhurried time to taste great wines and listen to the process of vintners magic. Great people and great wines: we left with good feelings…” ‘Nuf said? Fee: $10. Nov. 28–29 (10 a.m.–3 p.m.) We grow it. We make it. We live it. We love it. We are ready to celebrate the season and fill your glass with the release of our 2013 Ribbon Ridge Pinot Noirs and library selections. Also open Nov. 22. Tasting fee refunded with any purchase. Fee: $20. Nov. 22 (10 a.m.–3 p.m.) Annual futures (2013s) tasting and open house. Nov. 28–30: Our tasting room will be open by appointment for current release tastings and purchase. Fee: $20. Nov. 28 (10 a.m.–4 p.m.) Come enjoy the holiday weekend with our family and taste our premium selection of handcrafted Pinot Noir and Chardonnay. Wine tasting will be paired with locally baked bread and artisan cheese. Club members receive complimentary entry, call for details. Closed Saturday and Sunday. Visit our website for a special online offer. Fee: $20. By appointment only. Interested in avoiding the crowds and doing a private tour and tasting at our winery and Corral Creek Vineyard? Call us to arrange your visit before the limited spots are full. Fee: $40. Nov. 28–30 (11 a.m.–5 p.m.) Join us as we celebrate harvest with our finest estate-grown, single-vineyard and reserve wines, food and music. Interested in our newest releases on tap? Bring in your growler for a refill or purchase one of our second edition 1-liter growlers. Fee: $15. Nov. 28–30 (11 a.m.–5 p.m.) Join us at our Ribbon Ridge tasting room and celebrate with us, the release of our small-production 2012 Estate Pinot Noirs. Enjoy our limited inventory of the well-received 2011 vintage estate Pinots, all of which are accompanied by savory bites. Fee: $15. Nov. 28–30 (11 a.m.–5 p.m.) Visit us this Thanksgiving Weekend and sample our exceptional 2012 estate-grown Pinot Noirs including the newly released 2012 Victoria Pinot Noir. Grab the last few remaining bottles of our 2013 Rose to pair with your special holiday meals. Hors d’oeuvres will be served. 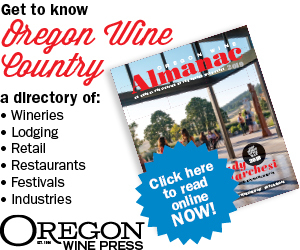 Come see why The Oregonian reported that we have “one of the best winery views in the entire Willamette Valley,” and stay to share a bottle or a glass with family and friends. Fee: $20. Nov. 28–29 (11 a.m.–5 p.m.); Nov. 30 (noon–3 p.m.) Minx of a mountain-top winery seeks adventurous relationship. You enjoy intelligence, irreverence, high-acid wines, and have a boatload of cash. We reveal our five jaw-dropping 2012 Pinots, exuberant new bubbles, and a screaming Chardonnay. Let’s mix it up. Fee: $20. Nov. 22 (11 a.m.–4 p.m.); Nov. 28–30 (10:30 a.m.–4:30 p.m.) Join Ron, Marianne, Matthieu and family/team as we debut our 2013 Sparkling Rosé & Chardonnay. Grab 2012 Pinots & Port from our Biodynamically-farmed estate vineyard. Pinot Noirs worth coveting. Fee: $15 (winery); $20 (vineyard). Nov. 28–30 (11 a.m.–5 p.m.) We grow Analog wine for a digital world, no overdubbing, no remixing. We grow Pinot Noir and Chardonnay on our vineyard, Lia’s Vineyard, in the Chehalem Mountains. We keep a small amount of fruit to make some really good wines. We sell a few bottles on weekends. Fee: $10. Nov. 22–23; Nov. 28–30 (11 a.m.–5 p.m.) Enjoy our new releases of full-bodied wines -Cabernet, Bordeaux blends, Merlot and other big and bold red wines. Wines will be paired with scrumptious appetizers in a welcoming atmosphere. Boutique, family-run winery with a small production of handcrafted wines. Fee: $10 (complimentary for club members). Nov. 28–29 (noon–5 p.m.) Native Flora is the Dundee Hills winery sanctum. From our stunning vista above the entire Chehalem Valley, we strive to produce premium estate wines in limited quantities for people who enjoy great wine, a good laugh, natural beauty and a more personal wine experience. Fee: $25. Nov. 22 (10 a.m.–4p.m. ); Nov. 28–29 (11 a.m.–4 p.m.) Happy Thanksgiving Taste a selection of Owen Roe Cabernet Sauvignon, Syrah, Pinot Noir, Chardonnay and popular red blends in our new Oregon winery. Fee: $15. Nov. 28–30 (10 a.m.–3 p.m.) Release of the 2013 Pinot Noirs. About 300 characters is not enough space to tell you all how good these wines are and the range of multiple terroirs they show. Suffice it to say that this is a great opportunity to taste land and plant interaction on a broad scale. Fee: $20 (partially refundable). Nov. 29 (appt. only); Nov. 30 (11 a .m.–4 p.m.) Join us by appointment only Saturday for private vertical tastings on our fermentation deck with Lynn and Ron Penner-Ash. Hear the stories behind each vintage straight from the winemaker. Visit website to choose your flight and purchase seats. Closed Friday. Saturday by appointment. Fee: $20–$50. Nov. 21 (11 a.m.–4 p.m.); Nov. 22 (1–4 p.m.); Nov. 28–29 (11 a.m.–4 p.m.) Come celebrate the new winery with us. We’re unveiling the beautiful 2013 Pinot Noir, Cabernet Franc, Malbec, Melange and Pinot Port. Enjoy the wines with delicious appetizers and chocolates. Fee: $20. Nov. 28–30 (11 a.m.–4 p.m.) Celebrating 20 years of winemaking, 20 minutes from Portland. Our tasting room features captivating Chehalem Mountain views. Enjoy a six wine tasting for $15 or a glass. Wines will be paired with fine cheese and charcuterie. Fee: $15 (waived with $50 purchase). Nov. 22–23; Nov. 28–30 (11 a.m.–4 p.m.) Lush vineyard setting, warm conversation will entwine with our high-end, small lot, handcrafted wines. Tasting four white wines and six red wines with bountiful appetizers. Fee: $15. Nov. 28–30 (11 a.m.–5 p.m.) Join us at August Cellars as one of the tenant wineries pouring for the long weekend. We’ll have a selection of our wines available for tasting. Food and Pitch Dark Chocolate will be available. Fee: $10 (includes wine glass). Nov. 28–29 (11 a.m.–5 p.m.) ROCO will feature a selection of 2012 single-vineyard Pinot Noirs , our stunning 2013 Chardonnay and a 2013 barrel sample. Enjoy live music, light nibbles and Corby’s new glass art. A great place to begin your day. Tasting room also open Sunday. Fee: $15. Nov. 28–30 (11 a.m.–5 p.m.) Serving artisan breads and cheeses out on the patio overlooking the vineyard 100-percent Ribbon Ridge estate wine Fee: none. Nov. 22 (10 a.m.–4 p.m.); Nov. 28–29 (11 a.m.–4 p.m.) Our doors are rarely open to the public, so we’d love for you to join us during one of our open house events. We’ll be pouring and offering for sale 2013 limited release Pinot Noirs, including Homer, along with our 2012 Estate Pinot and Chardonnay. Fee: $15. Nov. 28–30 (11 a.m.–5 p.m.) We are a small, authentic, family-owned and -operated vineyard and winery using sustainable farming practices. We grow and make small case lots of award-winning wine and pour in a lively atmosphere. Estate Pinot Noir, Riesling, Cabernet Sauvignon and Petit Verdot. Fee: $5. Nov. 22–23; Nov. 28–30 (11 a.m.–5 p.m.) Come taste our handcrafted, limited-production estate Pinot Noir and Celilo Chardonnay. Browse our Clay Art Gallery for holiday gifts and nibble light appetizers, including Estate Pinot Noir Jelly. Sip, shop and enjoy the relaxed atmosphere. Laura Volkman wines are also for sale. Fee: $10 (efundable with three-bottle purchase). Nov. 28–30 (11 a.m.–4:30 p.m.) Passion for Pinot? Don’t miss this opportunity, only open on wine weekends. Tresori established in 1997 now known for a captivating collection of estate grown Pinot Noir. Three vintages, logo glass, small bites and special pricing. A true vertical dating to 2007 also available. Fee: $10. Nov. 28–29 (11 a .m.–4 p.m.); Nov. 30 (noon–3 p.m.) Open House. In the heart of Ribbon Ridge, tour our subterranean barrel cave, fermentation hall and contemporary art gallery. Pouring 2013 Rieslings and Pinot Noir from the 2012 vintage. Admission includes all wines and delectable food pairings. Fee: $10. Nov. 28–29 (11 a.m.–6 p.m.) Join us during this special wine country weekend. Fee: $10 (includes appetizers and wine flight). Nov. 28–30 (11 a.m.–4 p.m.) Come on by and taste our four-vintage estate Pinot Noir vertical: 2010, 2011, 2012 and 2013 3-Clones. Releasing the 2012 Single Clones – Brigita 777, Mirabelle 115 and Hans Pommard. Hors d’oeuvres and Honest Chocolates. Fee: $25. Nov. 28–30 (11 a.m.–5 p.m.) Debut of our wonderful 2012 Pinot Noir. Of course, we have our other vintages available, including Chardonnay, several vintages of Pinot Noir, and our ever-popular Pinot Gris. Fee: $5 (waived with purchase).